Luxury Ski Apt Located In Quiet Traditional Swiss Village. Beautiful All Year. Le Preyet is set in a quiet corner of the traditional Swiss village of Veysonnaz in Valais, Switzerland with accommodation arranged over two floors. Veysonnaz is linked to the 4 Valleys by an 8 person high speed gondola and offers skiing for all abilities from beginners to advanced. The 4 Valleys also include Verbier, Nendaz and Tzoumaz. After a hard days skiing the apartment is extremely welcoming. There is a large balcony that wraps around the property offering extensive views of the Rhone Valley and its snow-capped peaks. Inside there is a wood burning fire, underfloor heating and open plan dining. Heated towel rails and power-showers ensure that your apres-ski evenings get off to a good start. The dining table extends to accommodate 12, and the kitchen is fully equipped with all modern conveniences. There is a handful of good quality restaurants in the village which offer a range of traditional Swiss cuisine. A boucherie, croissanterie & supermarket is located in the village. We live in Bath, England - a fabulous historic city. 3 children and a love of all things sporty and relating to keeping fit and healthy. We fell in love with the area of Valais, Switzerland having visited in Spring 2005. It is beautiful all year round with the added value of having extensive skiing appropriate for all levels. Le Preyet was built by a reputable, well established Swiss builder. The apartment is very comfortable and the views never fail to take our breath away. Our youngest child is 9 years old - and he has accompanied us on all of our mountain walks - anything from 8-15 miles so far! We visit the property regularly. We still haven't skied the whole area, and we clock up around 30 ski days a year! Swiss wines are a great find, and we have walked miles and miles of the mountains across the ancient 'bisse'. Montreaux Jazz festival is a great annual event, and combined with a mountain hike - Veyssonaz is a great location. Le Preyet offers all modern conveniences for a truly comfortable stay. Accessed through a private road - the property is well located for easy access to the resort, but away from the main area. 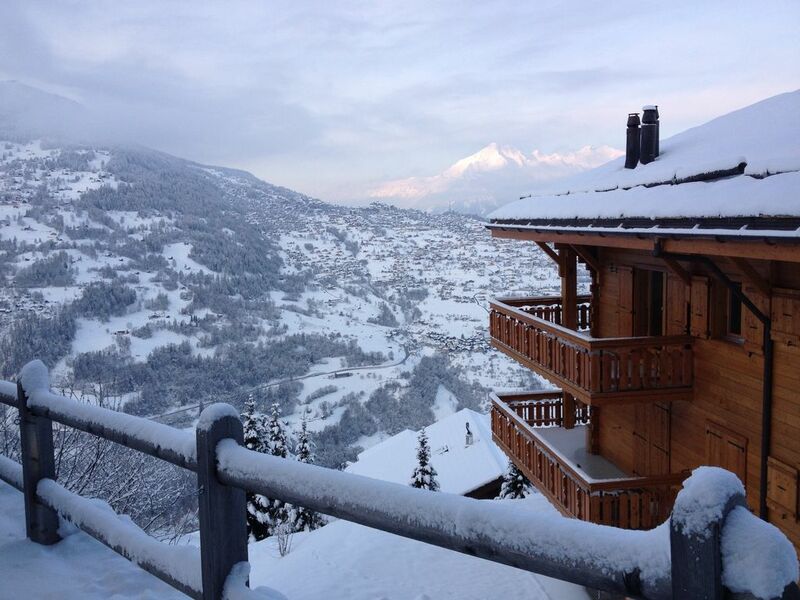 You can ski to Verbier, but it's equally nice to be located away from the bigger glitzy resorts. Veyssonaz is one of our favourite places. We'd love others to enjoy our apartment and the village as we have. Shower room 1 upstairs includes heated towel rail and power shower. Shower room 2 lower level include heated towel rail and power shower. Bathroom 3 lower level includes bath, shower attachment and heated towel rail. Open plan lounge, cosy yet spacious with large corner sofa, and additional sofa. Dining table extends to seat 12. Real wood burning fire. Spectacular views .Mezzanine area with sofa, bean bags & TV with Swiss cable and DVD player. Fully stocked kitchen includes, oven and hob, fridge freezer, stainless steel sink unit, dishwasher and microwave. Le Preyet is perfectly located only 5-10 minutes from Veysonnaz Gondola Station which will take you to a height of 2400m within 10 minutes. From Veysonnaz you have access to around 400km of skiing including the valleys of Verbier, La Tzoumaz and Nendaz. The gondola is walkable but there is also a free ski bus which can take you to the gondola, running every 20 minutes. There are over 6 golf courses within easy reach of the property including the championship course at Crans Montana used in the Omega Swiss open. The local course at Sion is also excellent. Notes on accommodation: In winter the property is heated by underfloor heating which is constantly regulated to ensure optimum comfort in all rooms. The property is ideally suited to families and couples. Modern quality furnishings and fittings extensively updated in 2014. Veysonnaz has lovely restaurants and a few bars. Le Preyet is accessed through a private road. In heavy snowfall access to Le Preyet is by a private pathway and steps leading from the additional parking above the property. There is a vilage ski bus that runs frequently to and from the gondola during the ski season - a ride that takes 10 minutes and you can drive to the gondola in 5 minutes. Outside: Le Preyet has a very large balcony that runs around three sides of the property and provides fabulous views of the mountains and valleys. Utility Room: Washing Machine Cleaning / Towels / Linen / Maid service: Bed linen and towels available for rent through local property manager if required. The property is cleaned weekly. The cost of cleaning is CHF 260. Ski lockers located by the gondola can be rented upon request. Other: WiFi Large spacious garage with ski-racks. TV/DVD player in quad room. CD player and selection of CDs located in kitchen. IPod/Ipone docking station. Located at entrance to hallway, armoire/cupboard to accommodate ski boots. This was my sixth visit to Le Preyet as it's the kind of place that draws you back time and time again. The booking process is very straightforward and the owners always ensure that the property manager is on hand to welcome you into the apartment. The apartment is centrally located in the beautiful village of Veysonnaz, part of the 4 Vallees network (the largest ski area in Switzerland) and with fantastic access to the pistes. Veysonnaz itself is wonderfully unspoilt, but with enough good quality bars and restaurants to cater for those wanting to get out and about apres-ski. From the spacious balcony the apartment commands spectacular views over the Sion valley located thousands of feet below, whilst the tastefully designed and beautifully maintained interior can accommodate, equally well, parties large or small on a self-catering basis. Having also visited during the summer months I would recommend Le Preyet as a base for exploring the area, with a whole range of different activities available from hiking along the famous 'bisse' trails up in the mountains to wine tasting at the neighbouring vineyards. A summer holiday in the Alps is seriously under-rated! I absolutely love this apartment its a home away from home. It's the best one we have ever stayed in as it feels homely from the minute you arrive with the comfy sofa's, truly stunning views, beds that take away those aches and pains from the slopes and board games that take you back. From the minute we arrived the family were able to spread out and enjoy themselves, its really hard to find somewhere that is big enough for us all but this worked a dream. Its location is superb, the village has all the facilities you need and more. I will come back again and recommend you to friends. Worth every penny. PS - the slopes were fun too! Appartement idéal pour d'excellents sports d'hiver en famille! Une magnifique semaine de ski de printemps avec 7 enfants entre 1 an et 8 ans! L'appartement est idéal (très bonne disposition pour 2 familles, confortable pour les adultes et bien équipé pour les petits), la station offre tout ce qu'il faut pour les petits, en haut des télécabines (école de ski, jardin des neige et même garderie pour les plus petits -Thyon 2000-), petit supermarché, boulangerie, boucherie à proximité... difficile de faire mieux, sans être au pied des pistes! L'appartement est conforme à la description et est très agréable à vivre. il y a de la place, des jouets pour les enfants. La table est un peu juste pour 12 personnes mais on tient en se serrant. l'accès au garage et à la place parking peut être compliqué en cas de neige( nous n'avons pas pu y mettre nos voitures mais il restait de la place en haut). Le gros bémol ne provient pas de l'appartement mais du service de bus de veysonnaz. il faut bien 5 minutes pour s'y rendre à pied mais surtout le service n'est pas continu ( pas de bus entre 11h et 15h30 !!!!!! ) donc pour se rendre en dehors de ces horaires au téléphérique, il faut malheureusement prendre la voiture. Thank you for the review its very much appreciated. With reagrd to the bus we were also surprised to hear this and can only assume that this was due to a technical issue. It is of course likely that the bus does not run every 20mins out of the peak weeks as it is assumed that everyone is skiing during the day as its a shuttle bus for Skiing. The bus itself is only 3 mins flat walk from the top of the chalet steps. Parking - during heavy snow falls the road to the garage can sometimes become blocked however there is relief parking available top cope with this. This is an 'unfortunate' problem with Skiing - glad you had so much snow that this was an issue! The table can accomodate 12 people however the Chalet is designed for 10 adults. When children are staying there is usually sufficent room to all sit around the table. Nous vous remercions de l'examen de son très apprécié . Avec reagrd au bus , nous avons également été surpris d'entendre cela et ne peut que supposer que cela était dû à un problème technique . Il est bien sûr probable que le bus ne fonctionne pas toutes les 20 minutes sur les semaines de pointe car il est supposé que tout le monde est le ski pendant la journée comme une navette pour le ski . Le bus se trouve à seulement 3 minutes à pied de l' appartement haut des marches du chalet . Parking - lors de fortes chutes de neige de la route dans le garage peut parfois se boucher mais il ya un parking de secours disponibles top face à cette . Ceci est un problème «malheureux» avec Ski - heureux que vous ayez eu autant de neige que cela était un problème! La table peut accueillir 12 personnes mais le Chalet est conçu pour 10 adultes . Lorsque les enfants sont hébergés il est suffisent habituellement à manger à tous assis autour de la table . Hiking and walking is in abundance in Valais, with easy access to the fabulous "Bisse" walks direct from Le Preyet. Mountain Biking is also popular. In summer, wine-tasting at some of Switzerland's best kept secret vineyards is less than a 30 minutes drive away. Montreaux Jazz Festival - June/July every year - 40 minutes away. Geneva airport is closest and is less than 2 hours drive. In the ski season, flights to Sion are sometimes available from the UK and other European airports. Montreux - 40 minutes-1 hour away. Evian, and Aqua Land (Water park) - 1 hour away. Lukerbaad - natural springs - 40 minutes away. 3 hour drive to Stresa, Italy. Our local Property Manager will arrange to meet you near the property on arrival and will look after your needs when you are staying at Le Preyet. A check in/check out service, hiring of towel and linen, and advice on the local area will be available. Booking Notes: To secure your booking a deposit of 30% will be required, payable in Swiss Francs. The balance of the rental plus the cost of cleaning is to be paid by bank transfer at least 6 weeks before your arrival. A refundable security deposit of CHF300 will be requested from our Property Manager and the cost of towels and linen is CHF 20 per bed. Swiss Tourist Tax is also required to be paid locally and directly to our Property Manager. Changeover Day: The property is let Saturday to Saturday. Check in after 1600 and check out before 1000. Notes on prices: Prices are in Swiss Francs and are are based on a weekly stay, Saturday to Saturday. Prices exclude cleaning costs, towels/linen hire, ski locker hire and local tourist tax. Possible discounts available for two week bookings plus. Please contact us should you wish a weekend stay in the summer or for last-minute bookings. Bookings are secured upon paying an advance deposit of 30%.